Health Secretary Shona Robison has heard a “very powerful case” from local campaigners battling to safeguard maternity and children’s units in Moray. 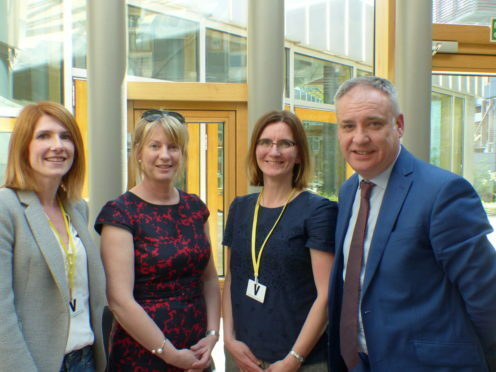 Representatives from the Keep Mum campaign and Richard Lochhead MSP held talks with the SNP minister on the issue at Holyrood yesterday. The meeting was arranged amid ongoing concerns the impact of staff shortages on women’s and children’s services at Dr Gray’s Hospital in Elgin. As a result of the issues, specialist overnight care for children was suspended recently and some women were having to be transferred to Aberdeen’s maternity unit. Kirsty Watson, chairwoman of the Keep MUM campaign, had vowed to keep up the pressure to safeguard the long-term future of the units ahead of yesterday’s talks. Mr Lochhead, who has repeatedly raised the issue at Holyrood in recent weeks, said it had been a “very constructive and valuable meeting”. He added: “Given the importance of the maternity unit to the local community I felt it was imperative for the Keep Mum group to meet with the health secretary to appraise her of the campaign. “Kirsty Watson and Susan Coull put forward a very powerful case for supporting the maternity unit and the associated children’s services. “The challenges facing more rural hospitals in attracting medical staff is well known and we discussed possible solutions, particularly around trainee doctors. “The health secretary was very familiar with the issues at Dr Gray’s and helpfully suggested some steps that should be looked at. Last month, Ms Robison insisted that the Scottish Government had “no plans to change the status of the consultant-led maternity unit at Dr Gray’s Hospital in Elgin”.